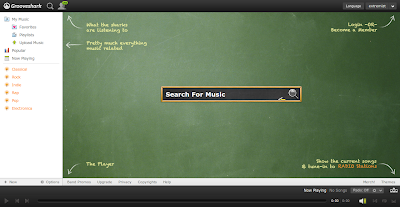 Grooveshark Interface Receives an HTML5 Boost! As if you don't know this already, Grooveshark is an online music broadcasting application. Nobody puts it better than TNW, "Grooveshark is a wonderful application that we intend on using until someone sues them into the ground." Grooveshark ditched its previous Flash based interface and now has a much more sleeker and lighter HTML5 based one. If you are wondering what makes HTML5 technology so special, you should check out this collection of 15 HTML5 demos showcasing prowess of HTML5 over Adobe Flash. I had problems with the previous Flash based interface of Grooveshark, but the new HTML5 based interface is a delight to use. It definitely feels a lot lighter and faster than anything I have used before. Experience the new awesome Grooveshark.